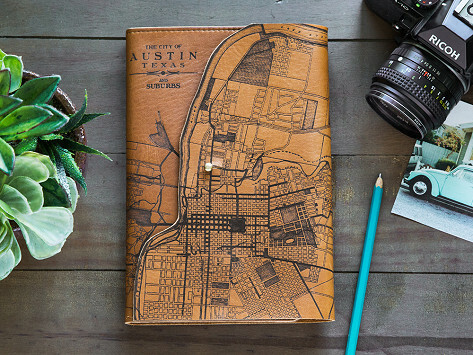 A modern take on an ancient craft, this Made in the USA etched leather notebook cover showcases your favorite city. 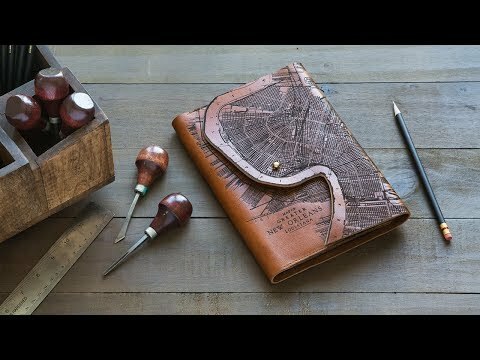 The supple leather hides are sourced from a local Milwaukee tannery, then hand cut and laser-engraved with antique, early 20th-century maps of American towns. The included Moleskine notebook is replaceable, so you can always carry your thoughts in something beautiful that’s Made for a Lifetime. Dimensions: 6" x 9" x 1"
Very beautiful and durable. The case is well crafted. Makes an unique gift. I may need to order more. Tactile Craftworks journals come equipped with a removable (and replaceable) Moleskin notebook. So you can fill up as many pages as you want again, and again. Regardless of what you fill them with, these heirloom-quality covers wear beautifully and are worthy of your best ideas.